For many of our clients arrested for an Alabama DUI, the most common reaction is shock that they now face being accused of the crime of driving under the influence. Once that initial shock wears off, and they have recovered their vehicle, most will look over their paperwork and realize that they need to contact a DUI lawyer immediately. Because an administrative driver license suspension or revocation has been triggered by the arrest for DUI in Alabama, this instinctive reaction is spot on! Fighting to clear their good name is the focus of most of our DUI Alabama clients. The next most important factor, for the overwhelming majority is saving the right to drive, since a first offense DUI in Alabama causes a TOTAL loss of ability to drive for 90 days. Less obvious, but equally important is the triggering of an administrative license suspension or license revocation (depending on which Alabama DUI offense this may be — first DUI offense, 2nd DUI, DUI 3rd or 4th DUI). An administrative driver’s license suspension in Alabama can take away your right to drive long before the DUI Alabama criminal case gets resolved. These two matters are separate and distinct, so it’s important to immediately contact and work with an Alabama DUI attorney who is well-versed in both, and can save your Alabama driver license. “Polson” is the name known by Alabama attorneys for saving driver’s license privileges, and especially well-known among Birmingham DUI lawyers for preserving driving privileges for people accused of DUI in Alabama. Though your driver license Alabama can be suspended, revoked or cancelled by the Alabama Dept of Public Safety after a criminal conviction for driving while intoxicated (DUI) is reported to them, the first opportunity for the State to suspend your driver license will be at an administrative suspension action that takes effect 45 days from the date of your arrest for driving under the influence. As stated by senior partner of our DUI law form, Mark Polson, you must act to appeal your pending administrative suspension within 10 DAYS of your DUI arrest in Alabama. Under Alabama DUI law, the fate of HOW LONG your Alabama drivers license will be taken away is determined by several factors, including number of prior DUI convictions. Repeat DUI offenders need one of our DUI lawyers even more than a first offense DUI in Alabama. How is the DUI License Suspension created by an Alabama Drunk Driving Arrest? An administrative license suspension is triggered from either (1) refusing to take the breath alcohol test pursuant to the Alabama implied consent law, or TAKING the alcohol breath test and then testing over the state’s legal limit of 0.08%. For accused drunk drivers facing underage DUI, this BAC level is only 0.02%. Any CDL-licensed driver in a commercial truck or bus (as defined by Alabama DUI laws) is held to a 0.04 grams percent BAC, since commercial motor vehicles pose a greater risk for catastrophic injury or death to the driving public, in the event of an accident. Jail time of 5 day to one year OR 30 days of community service or more, at Judge’s discretion. Total loss of driving privileges for a full year, followed by installation and maintenance of ignition interlock for another 24 months (costing around $6000 or more for the full two years). Mandatory mental health treatment, from a substance (alcohol or drugs) abuse counselor. Fines of between $1,100 to $5,100 for a second DUI. How long is the DUI license suspension in Alabama, resulting from a DUI administrative driver’s license suspension? The length of the administrative license suspension imposed by the Alabama Department of Public Safety varies in length depending on your “alcohol or drug-related enforcement contacts” during the preceding five-year period. From this wording, you can see that Alabama DUI laws don’t just “count” DUI convictions. This is one of the types of special knowledge about an arrest for a repeat offense Alabama DUI that mandates having a top Alabama DUI lawyer helping you. Translated to normal speech, a DUI first offense gets his or her driver’s license back much quicker, under the Alabama DUI administrative driver’s license suspension laws. This convoluted language has a purpose, which is to allow any out-of-state convictions to count, as well as both a previous administrative driver license suspension OR an administrative drivers license revocation, plus any criminal case convictions for DUI in Alabama. These are the unique rules required under Alabama DUI laws, and knowing how to avoid being classified in a manner that causes a harsher loss of driving privileges is one main reason you hire the best Birmingham DUI lawyer. The administrative license suspension range of license suspension of all driving privileges runs from a minimum of 90 days (for a dui first offense) to a maximum of five (5) years for a 4th DUI in Alabama. Fortunately, Alabama driving under the influence laws limit an “enforcement contact” to only one “offense” even if the driver loses both the administrative suspension and the DUI criminal offense that are part of the same DUI arrest in Alabama. Alabama DUI laws relating to the administrative license action offer your Alabama criminal defense lawyer some “negotiating” options and benefits over the options available in dealing with the criminal court prosecutor. A knowledgeable DUI lawyer in Alabama can take certain actions to restore an Alabama driver’s license, or help the Alabama DUI client follow another, special path to shorten the DUI driver’s license suspension period for the ALS (administrative license suspension) that was triggered by a DUI Alabama arrest. From our Alabama DUI laws: 32-5A-304 Period of suspension; relation to Section 32-5A-191. A driving privilege suspension shall become effective 45 days after the person has received a notice of intended suspension as provided in Section 32-5A-303, or is deemed to have received a notice of suspension by mail as provided in Section 32-5A-302 if no notice of intended suspension was served. Ninety days if the driving record of a person shows no prior alcohol or drug-related enforcement contacts during the immediately preceding five years. One year if the driving record of a person shows one prior alcohol or drug-related enforcement contact during the immediately preceding five years. Three years if the driving record of a person shows two or three alcohol or drug-related enforcement contacts during the immediately preceding five years. Five years if the driving record of a person shows four or more alcohol or drug-related enforcement contacts during the immediately preceding five years. For purposes of this section, “alcohol or drug-related enforcement contacts” shall include any suspension under this article, any suspension or revocation entered in this or any other state for a refusal to submit to chemical testing under an implied consent law, and any conviction in this or any other state for a violation which involves driving a motor vehicle while having an unlawful percent of alcohol in the blood, or while under the influence of alcohol or drugs, or alcohol and drugs except that no more than one alcohol or drug-related contact on any one DUI arrest may be considered by the department in determining the period of suspension. If a license is suspended under this section for having .08 or more by weight of alcohol in the blood of the person and the person is also convicted on criminal charges arising out of the same occurrence for a violation of Section 32-5A-191, the suspension under this section shall be imposed, but no period of suspension or revocation shall be imposed under Section 32-5A-191. If a license is suspended under this section for having .08 or more by weight of alcohol in the blood of the person and the criminal charge against the person for violation of Section 32-5A-191 is dismissed, dropped by the prosecution, or the person is acquitted of the charge, the director shall rescind the suspension order and remove the administrative suspension from the person’s driving record. 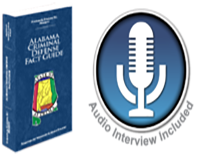 Please note that, while every effort is made to regularly update the herein stated Alabama DUI laws, legislative action and or appellate court decisions on DUI in Alabama may have changed some parts of the above-stated legal summary. Being charged with driving under the influence is very serious and can carry consequences that will impact your life for years to come. The entire team has successfully defended persons charged with DUI for over 55 years. To learn how the Birmingham DUI lawyers at our Polson Law Firm can help you, please contact us for a FREE Professional DUI consultation now! In some cases, a DUI accident will sideline our client for a while. We Can Come To You, if necessary, anywhere in Alabama. We Fight Alabama DUI Charges across the State of Alabama, as well as other misdemeanor or felony criminal charges. Call us now at our main office. 205-871-8838, or toll-free at 1-844-776-5766. When you only have one chance to win, why not go with an experienced Alabama DUI lawyer from Polson Law Firm?